Nearly one year ago, Serif released Affinity Photo for the iPad as a full-featured photo editing powerhouse. Unlike what companies such as Adobe do, where a Mac app like Photoshop is broken down into less powerful versions on iOS, Affinity Photo was brought to the iPad with no compromises whatsoever. Today, that same philosophy is bringing us Serif's second major iPad app: Affinity Designer. Where Affinity Photo focuses on photo editing, Affinity Designer is a vector-based illustration tool. And with full support for the Apple Pencil, iOS 11's drag and drop, and system technologies like Metal, the app looks like the ultimate portable design studio. For a limited time, Affinity Designer is available at a launch price of $13.99, 30% off the regular price of $19.99. If this kind of app in any way interests you, it looks like a steal at this price. 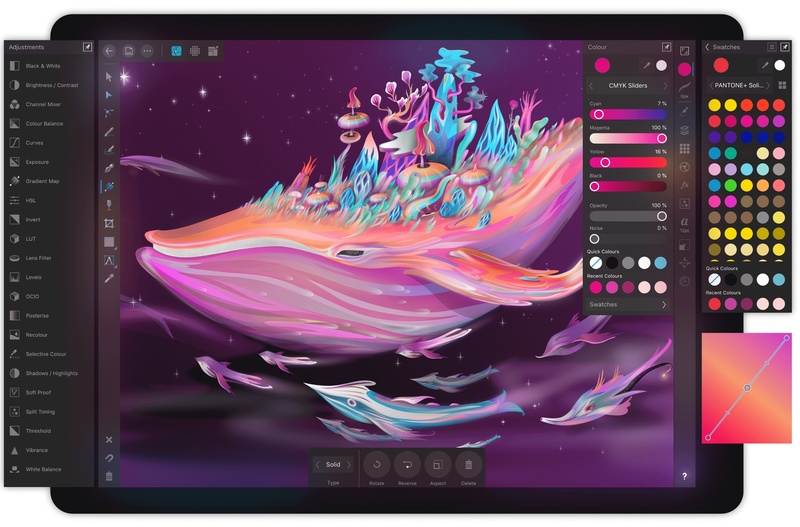 One important note is that, similar to Affinity Photo, due to the power demanded by Affinity Designer, it's only available on a select number of iPad models: all iPad Pros, plus the iPad Air 2, and the 5th and 6th generation iPad.